Italy is considered one of the most romantic places in the entire world. Italy and Italians are in love with love and many moments feel like something out of romantic movie. So what better place to celebrate love and get married than Italy? Imagine exchanging vows on a terrace overlooking the beautiful Amalfi Coast. Or how about a ceremony set in a Tuscan vineyard? And for the honeymoon? We’ve got that covered. 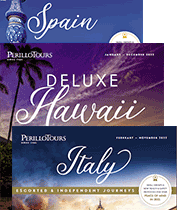 We will create a custom honeymoon just for you or help you join one of our famous Perillo escorted tours of Italy. Civil ceremonies are officiated by an Italian authority and are legally recognized in your country. A civil wedding must be performed in a town hall. You can get married in a stunning city hall or even a small-town hall. These town halls are located in beautiful historic buildings or even grand palaces. The ceremony is performed in Italian by the mayor or civil registrar. It can then be translated into English by an interpreter. The content of the marriage ceremony includes traditional marriage vows and articles of the Italian civil code. It can also include personal vows and poetry. There must be two witnesses for the 20 to 30- minute ceremony. Depending on where you get married, you will need to sign a Declaration of Intent to Marry a few days before the wedding at the city hall in Italy. According to Italian law, a divorced woman or a widow cannot remarry unless 300 days have passed from the date of the Decree Absolute or death of the previous spouse. So these are legal ramifications to consider. If you would like to get married in Italy but don’t want to worry about the legal paperwork or you’ve already been married in your home country, a symbolic ceremony is the best option. The ceremony is not legally binding and can be completely customized to be exactly what you want. The content of the symbolic ceremony can include personal vows, poems, songs, even pagan rituals. The ceremony can be performed by anyone – a family member, pastor or a local Italian. A symbolic ceremony gives a lot of flexibility as it can be held anywhere from a vineyard to a garden to a palace or museum. If you can dream it, we can do it with a symbolic wedding ceremony in Italy. Whichever type of wedding ceremony you choose, we can help you with every aspect of the planning starting with the selection of the locations for the ceremony and wedding reception to flowers, decorations, cakes, photography, video, music, transportation and accommodations. Romantic Escape – A simple package designed just for the two of you including the wedding ceremony and a photographer at disposal for 2 hours. Sweet Love – A more sophisticated package including the wedding ceremony, a photographer at disposal for 3 hours and wedding reception dinner. The Ultimate Celebration – An all-inclusive package which includes the wedding ceremony with live music, a photographer and video maker at disposal for 3 hours, wedding reception dinner and bridal makeup. If they don't quite cover what you're looking for, you can create your very own custom Italy Wedding package! If you have any questions at all, feel free to chat with us. Our agents are just a call away and are happy to help you plan your perfect wedding.